The third time proved to be a charm for Felix Alvarado. 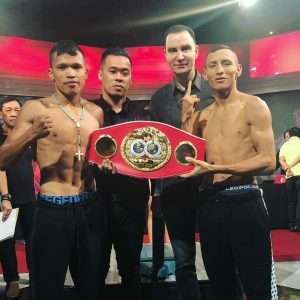 A relentless workrate coupled with a sustained body attack paved the way for the 29-year old from Nicaragua to capture a vacant junior flyweight title, halting Randy Petalcorin in seven rounds Monday in Pasay City, Philippines. Petalcorin did his best to keep pace but was ultimately sent home courtesy of three knockdowns in round seven. The last of the three forced the Filipino to the canvas for the full ten count, producing a knockout at 2:04 of round seven. It was never that easy for Alvarado, whose previous title bids resulted in back-to-back road losses to Kazuto Ioka in Japan and Juan Carlos Reveco in Argentina. The latter defeat came in June ’14, with Alvarado having rattled off 15 consecutive wins—all but one coming inside the distance—coming into Monday’s clash with Petalcorin, a former interim titlist making his first attempt at a real belt. Their main event battle—which aired live on ESPN+ in the United States and TV5 in the Philippines—was fought at a furious pace and supremely high skill level. Alvarado forced the action early and essentially throughout, while Petalcorin favored efficiency over volume, the southpaw riding out the early exchanges and countering with straight lefts highlighting his combination punching. Realizing that Alvarado wasn’t going to let up, Petalcorin took the initiative in the middle rounds in his best efforts to keep his opponent at bay. The biggest difference in their methods of attack was body punching. Whereas Petalcorin sought to take the lead when the opportunity arose, Alvarado never stopped going downstairs. It was an investment that reaped dividends, even if it meant giving away rounds to reach his end goal. During nearly every exchange, Alvarado would at some point catch his foe with a left hook or right hand to the body, often setting up the shots with straight right hands upstairs. Meanwhile, Petalcorin’s strategy only proved aesthetically pleasing but not particularly effective. The 26-year old title hopeful often found a home for his left hand, but never put enough behind it to make Alvarado break stride. It wasn’t for a lack of trying, but rather his absorbing a tremendous amount of body punches taking the sting off of his attack. Alvarado picked up on this as the fight entered the second half, intensifying his own offensive attack. A right hand upstairs followed by one to the body forced Petalcorin to a knee just inside the first 40 seconds of round seven, at which point in the round he’d already landed six purposeful body punches. Petalcorin managed to beat the count but was visibly struggling to catch his breath as referee Ernie Sharif—after giving the boxer a hard look—elected to allow the action to continue. Alvarado went right back on the attack, at times a bit wild but settling down just long enough to prompt his foe to once again take a knee just past the one minute mark. The sequence looked to have finally beaten the fight out of Petalcorin, who was up at eight but bearing a lost look on his face as Sharif asked if wanted to continue. Action resumed, with Alvarado finishing off the local favorite with a flurry of power punches. A left hook to the body knocked the wind out of Petalcorin, with a right hand upstairs serving as window dressing as he once again fell to a knee. This time, Sharif reached the full ten count in waving off the contest at 2:04 of round seven. Alvarado (34-2, 30KOs) has now racked up 10 straight knockouts—all within the past two years—amidst a current 16-fight win streak. With the win, he picks up a title left behind by Hekkie Budler, whom he was supposed to challenge earlier in the year after the South African boxer inherited two mandatory challengers following his two-belt win over Ryoichi Taguchi this past May. The title, however, became available when Budler vacated in lieu of being stripped due to their mandatory title fight failing to secure the minimum purse bid requirement during a hearing in July. Bulder was never keen on defending by the October deadline as it was, opting to relinquish the strap in lieu of being stripped. Nevertheless, the ugly side of boxing’s politics provided an opportunity for Petalcorin (29-3-1, 22KOs) to challenge for first major title. He’d briefly reigned as an interim titlist, but his first bid at the real thing results in a six-fight win streak coming to a close—and persistence paying off for Alvarado, who joins top-rated flyweight Cristofer Rosales as Nicaragua’s lone current major titlists.